Rocket powered bicycle on a roll. 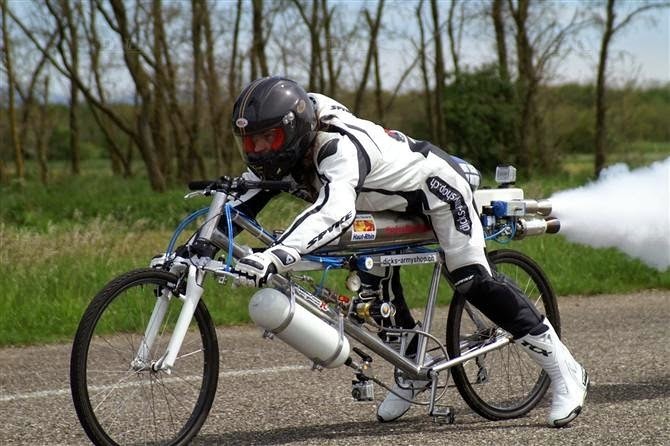 Francois Gissy rode a rocket powered bicycle to a record speed of 207mph on Nov. 7, 2014. The record run was made at the Circuit Paul Recard racetrack in Le Castellet, France. Gissy’s special bicycle has pedals and a chain, but he didn’t use them to set the record. Gissy fired a rear mounted hydrogen peroxide rocket motor to reach max speed in just 4.8 seconds. Needless to say, Gissy wears full leathers and a motorcycle helmet when he rides this “bicycle”. The bike was designed by Gissy’s friend, Arnold Neracher of Exotic Thermo engineering. What’s next? Neracher has plans for a larger/stronger bicycle that they hope can hit 249mph. The YouTube video shows Gissy launching his bicycle down the long Mistral Straight at Circuit Paul Recard. The bike easily out accelerates the Ferrari 430 Scuderia he races.